Nora Grey’s life is pretty normal, until Patch comes along. Suddenly, weird things start to happen, and Nora finds herself struggling to not only understand what’s going on in her nice ordinary life, but also for her very survival. 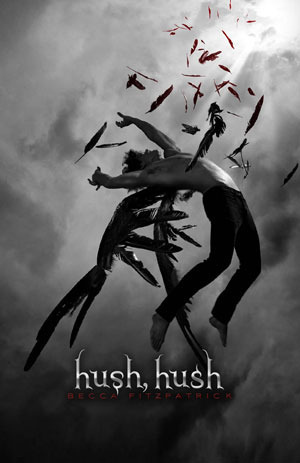 Hush, Hush comes in on the darker side of the YA paranormal romance; murder, assault and home invasion are just a few of the problems Nora has to deal with, with Patch’s mysterious nature not at all helpful in letting her come to terms with the strange events overtaking her life. At times, to the experienced adult reader, the story felt a little over-contrived, with more twists and turns than were perhaps necessary to the book. In general though, the plot moved well, and the characters were engaging as their secrets unfolded. Nora’s conflicting emotions were a driving force, and one which many adolescents will relate to. The unusual nature of the supernatural inherent in the story was intriguing, and I wanted to continue to find out more about the angels and their backgrounds. As a first-time novelist, Ms Fitzpatrick has produced a sensational debut, and I’d be surprised if her name doesn’t appear on more popular titles in this genre in the very near future.